Mirrors are the center piece of a new bathroom. But for anyone who’s tried to apply a flawless amount of peachy blush, perfect a classic fishtail braid or pluck (without over-plucking) an ideally shaped brow while leaning over the bathroom sink, not just any mirror will do. Enter the lighted makeup mirror. 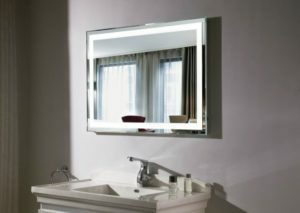 Often called a lighted vanity mirror or, simply, lighted mirror, these illuminated options aren’t defined by their utility. They also add old-school elegance to the surrounding space. 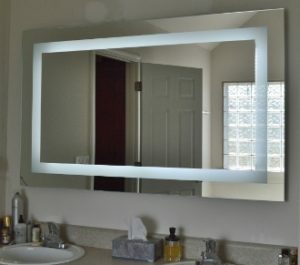 Here are five ideas to help you create, construct or buy the perfect lighted makeup mirror for your home. 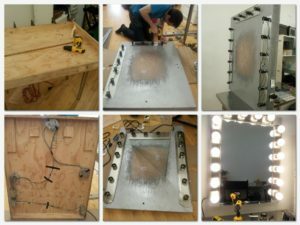 Building the ideal lighted vanity mirror doesn’t have to mean starting from scratch. Old desks or dressers can easily be repurposed. Leftover pieces of plywood or materials from previous remodeling projects also make great bases for a lighted mirror. Consider perusing flea markets and other secondhand stores for viable components. Those living in the Portland area can drive around looking for discarded furniture donning a “free” sign on a random street corner and will certain have options. From there, a little stain or paint can give the item new life. Adding polka dots or stripes can be a playful way to make the vanity your own. 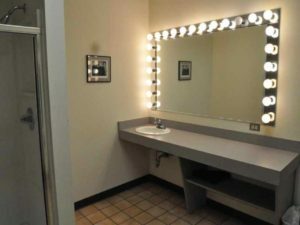 Whether the initial piece is your trash or someone else’s, you’re sure to treasure the resulting lighted makeup mirror. Who wouldn’t want to channel their inner Ingrid Bergman when powdering their nose? Surrounding a mirror with light bulbs is a great way to give a lighted makeup mirror the Hollywood treatment. Get creative with the mirror’s shape (don’t forget full-length options!) and the size of the light bulbs. Even the chair is up for interpretation, with fancy throw pillows or cushions enhancing the spoiled-celebrity feel. Add a coat of black or white paint to the surrounding vanity, and voila! You’re ready for your close-up. Two is pretty much always better than one, and that principle is especially true when it comes to lighted makeup mirrors. While vanities tend to fly solo, there’s nothing that limits a designer to just one mirror. Two surrounded with string lights or light bulbs enable twice the primping. Although the “makeup” part of the description can sound limiting, who wouldn’t appreciate a brighter look when checking their teeth for meal remnants, getting close and personal with their razor or dealing with a pesky blemish. For anyone who’s ever danced around a roommate or partner while trying to get ready and out the door, this double lighted makeup mirror solution is a no-brainer. 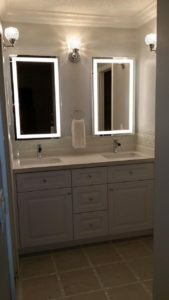 In smaller spaces, lighted mirrors often work best when separated from bulky vanities. That’s when wall-mounted or hanging options become lifesavers. A bit of rope can give the lighted mirror an industrial feel without the bulk of an attached wooden desk. By hanging a lighted makeup mirror, the designer has additional options on where to put it. While it might not make sense to have a full lighted vanity in the living room, a suspended alternative looks right at home. A floating shelf or countertop under the mirror can be an ideal place to store hair pins, eyeshadow palettes and a variety of cosmetic tonics. One way to give a lighted makeup mirror a one-of-a-kind look is to go transparent. Simply replace the top of the dresser or vanity with a sheet of sturdy glass, showcasing a sneak peak of the goods inside. This can also be a much-appreciated option for those who tend to lose things in the bottomless pit that is a regular sized drawer. Clean-up gets a lot simpler as well: The same glass cleaner than removed powder smudges from your lighted makeup mirror erases Picasso-esque colorings from the tabletop.